I started book blogging around February 2013, so almost a whole year ago. I love so many things about it. I've made some really great friends. Outside of the blogosphere, I don't know that many people that are as obsessed with books as me so it's such a relief to get on twitter and start talking to other book lovers about an author I adore or a book that I loved beyond words. In a really weird roundabout way my book blog got me my internship at P.S. Literary too, which is amazing. YA. I'm completely in love with YA books. I'll read any genre within YA, but I have a special love for horror and thrillers. I'll read Adult horror/thrillers and the occasional MG book as well. Anything by Nova Ren Suma, John Green, Courtney Summers, Gretchen McNeil, Lexa Cain, Kendare Blake, and Laini Taylor. It's between two events. I met Lexa Cain through book blogging, which is amazing. She's the best critique partner a girl could ask for and a great author. The other is getting my internship with P.S. Literary. A long story quick: Carly Watters liked my post on The Importance of Critique Partners enough to link to it on her blog. I was super excited, of course, because she's a remarkable literary agent. Then I started to look around on her blog and happened to see that they were looking for internships. I applied and got the position. I don't know if I would have caught the window for application if I Carly hadn't linked to that post. Harry Potter. This is the obvious, boring answer, but the wonder is reading that series is so exceptional, that nothing else will ever come close. Especially the big reveals in Deathly Hallows - most of which I secretly hoped would happen. I enjoyed Harry Potter as well. :) Happy Friday! I loved the Harry Potter books too. That was almost my choice! I like HP. Good choice. Harry Potter and the Sorcerer's Stone was my choice, I think it was the first book I read in one sitting. Simply magical. I have yet to read this series. I saw the movies and I am worried reading the series will ruin the movies for me. Great choice! Old follower! I've never been interested in reading HP, since I tend to avoid books surrounded by massive hype, and generally dislike them the few times I do give them a try. I think Harry Potter is a great choice! I think that is probably going to be a popular choice..lol. It was an icon series for me because I has in my late twenties when I read them and I almost didn't read them..lol. Same as Rachel. I agree that Harry Potter is a great choice. Happy FF. Old Bloglovin' follower. Cool feature. It's okay to be such a die hard fan of a book, it always mesmerizes you when you re-read the story. I almost said Harry Potter. Good choice. Have a great week. Harry Potter seems to be the popular choice today! It was nearly my choice, as well. Happy Friday! Just to let you know, cooper and newbielibrarian do not have F&FF posts. One is about cats (she links to this meme every week) and the other is a religious site! Hi! 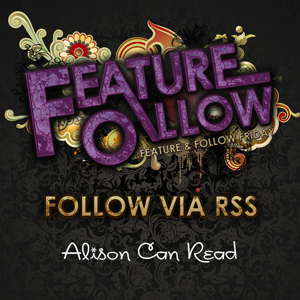 I love the Feature And Follow Friday and nice blog! I am new and I just started participating in this today. : ) I loved the Harry Potter series too, but I chose The Hunger Games. HP is a great choice! I've only read 2 - 3 books of HP and I just watched the movie. But good choice. The books were definitely better. HP is in it's own class. Happy Friday Alison. Have a gread day. If I can read one book again for the first time it would be The Mercy Thompson Series! All the feels I had while reading that is awesome! Happy Friday and enjoy your trip. Just wanted to say you have a wonderful blog Alison. I love the color theme, it's really eye catching. Wonderful informative reviews as well. Keep up the great work on this lovely blog.